SANTA FE, NM. The Foundation to Protect New Mexico Wildlife, founded by Governor Bill Richardson and Robert Redford, and Return to Freedom Wild Horse Conservation are joining forces to urge federal officials to immediately stop plans to remove the Salt River wild horse herd from their home range. 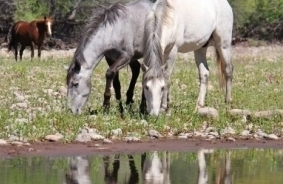 The U.S. Forest Service has announced plans to remove about 100 horses from Arizona’s Tonto National Forest. The Salt River Herd is unique, most likely tracing back to early Colonial Spanish horses and has survived there for more than 100 years, adapting to the unique environment. The Foundation to Protect New Mexico Wildlife and Return to Freedom Wild Horse Conservation are calling on Secretary U.S. Department of Agriculture Tom Vilsack and U.S. Forest Service Chief Tom Tidwell to not only reconsider plans to remove the Salt River Wild Horses, but to also implement a humane plan to manage the herd as an integral part of the Tonto National Forest where they exist today. The Salt River Herd has been coexisting harmoniously since the late 1800’s and possibly earlier. The Forest Service has acknowledged their presence since at least the 1930’s prior to the passing of the 1971 Wild Free Roaming Horses and Burros Act. “The horses enrich the experience of the tourists to the area and enrich the lives of the local community who are proud of this Heritage Herd,” said Neda DeMayo, President of Return to Freedom. Just across the river the herd who lives on the Pima-Maricopa Tribal lands is being managed with birth control (native PZP) by the tribe. A local group, The Salt River Wild Horse Management Group, has offered to manage the horses with the contraception and has been actively involved in creating an identification database and monitoring the herd.